Plato introduced the legend of Atlantis to his Greek audience in two of his lesser works, Timaeus and Critias. The lost continent quickly seized the Western imagination and has been the focus of many a bold adventure and much wild speculation in the past couple of millennia. Atlantis has also been the setting of many a wild and wonderful tale. Robert E. Howard, the creator of Conan and father of the Sword & Sorcery genre, wrote of Kull – a powerful and brooding barbarian of Atlantean descent who rose from obscurity to become king of Valusia, the mightiest kingdom of his primordial age. Whatever the real truth of Atlantis may actually be and regardless of what prehistoric reality actually inspired the tale, Atlantis- after 2,000 years as the focus of human striving – has become a living location – an actual place – in our collective imagination. To many a modern seer Western Civilization is Atlantis reborn: the story is our guiding mythos and carries a prophetic warning. Will we heed it, learn our lessons and avert a catastrophic fate? 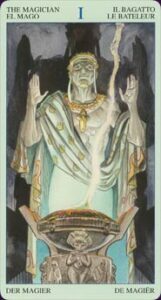 The Tarot of Atlantis allows you to visit the lost continent and gain wisdom from its inhabitants. All the strands of the Atlantis legend are woven into this colorful deck: the barbaric Sea People who live by the sword… the exotic parent civilization of South America, Egypt, India and the Ancient Near to Middle East… the Powers once worshiped by the Greeks and Romans… and yes: lots of menhirs and mass destruction. The Tarot of Atlantis is a collaborative effort (Bepi Vigna, Pietro Alligo, Massimo Rotundo, Mario Pignatiello), like many Lo Scarabeo decks, and is distributed exclusively by Llewellyn in the USA. The Major Arcana depicts the fall of Atlantis and each suit in the Minor Arcana depicts an extreme aspect of Atlantean life. The Chalices, for instance, are very sensual and the Swords are filled with war and strife. 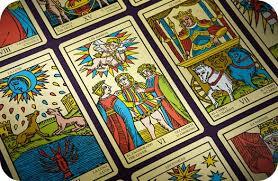 The colorful graphic-novel style art effectively evokes the mood of each card and should serve well in ritual work, guided visualization and active imagination exercises. Aside from divination and metaphysical practices, this deck can also be used as an aid to role playing games and as a stimulus to the imagination of storytellers, especially those inclined towards telling heroic tales set in time-lost lands. Atlantis remains an important satellite in my own personal mythos. 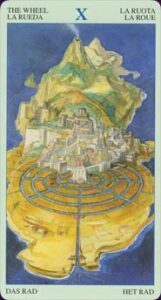 The Tarot of Atlantis allowed me to experience the archetypal sunken continent in a whole new way. I had a pleasant and exciting time and now yearn to revisit Atlantis time and again. With this deck in hand I can do so, whenever my archaic heart desires.